Compared to the rest of the seasons, drivers appear to be on their best behaviour after the dog days of summer are over. Drivers say they get fewer traffic tickets during the fall months-October, November, and December-than any other time of the year. 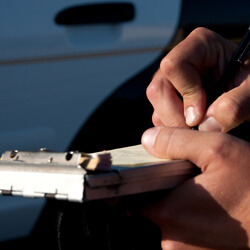 Speeding tickets are one of the most common types of traffic tickets that drivers receive. Drive at a speed that is within the limit but also suitable for the weather conditions. Transport Canada estimates that about 95 per cent of Canadians buckle up. However, police still consider not wearing a seatbelt as one of the "Big Four Killers" on the road and will quickly ticket a driver if not all passengers have one on. In collisions where there's a fatality, about one-third were not strapped in. Stay safe by buckling up and avoid a ticket. Stop when you're expected to stop. You may think that running a red light or failing to fully stop at a stop sign will help you get to where you want to go faster, but it's dangerous and comes with a hefty fine. All provinces and territories (aside from Nunavut) have some form of distracted driving-related legislation in place. Make the roads safer for you, your passengers, and everyone around you by paying attention to your surroundings and avoiding distractions and bad driving habits. When you're ready to make a turn, make sure it's allowed first. If prohibited, an improper right turn, improper left turn, or an illegal u-turn may also come with a couple of demerit points. Has a ticket lightened your wallet? Did you know that traffic ticket convictions affect your insurance rates for at least three years? With a less than perfect driving record, you can find yourself paying a lot of extra premium until it is wiped off your record.